New art thing I made. Algorithmically generated. This is actually a 3x3 array of the same basic 3x3x5x5 piece run with different seeds 9 times. Within each of the 9 pieces are 3 different 5x5 grayscale "origin" arrays (they alternate right and left alignments). Each origin array is then translated (with non-number symbols corresponding to particular kinds of calculations based on surrounding cells) into a 5x5 array of sub-arrays (2x2 CMYK-value arrays). 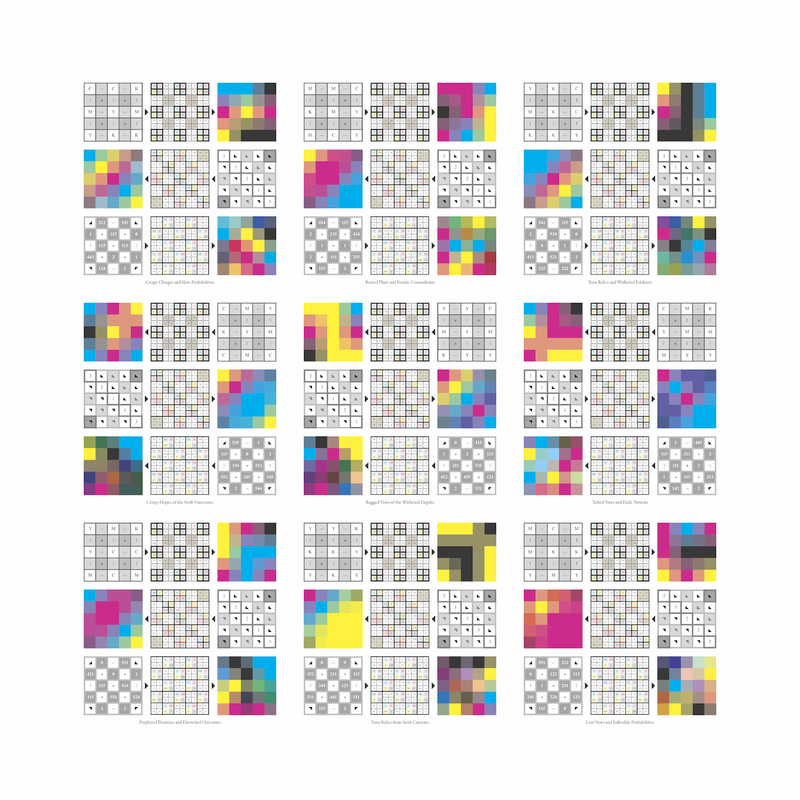 The black triangle pointer/arrow things show this progression from origin array to an intermediate 5x5x2x2 color data array. 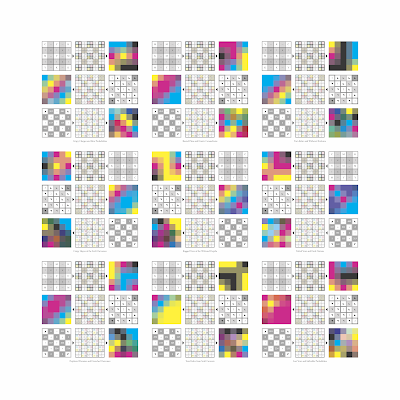 Then, progressing to the next array, each 2x2 sub-array of CMYK values is assigned as an actual color for each cell in the last 5x5 array. Each of the 9 pieces has a title (for example, "Tufted Vows and Dark Notions") which is generated from the contents of 3 specific cells of each of its 3 origin arrays. The total namespace is 216,000 (3x12x15x16x25), so it's a little odd that some of these are so similar. That's randomness for you though. Ultimately, the whole poster is a big 3x3x3x3x5x5(x2x2) array.